Whether you have a new picture that needs framing, an old much treasured item that is looking a bit tired & needs a new lease of life or pretty much anything that you’d like to frame & hang on the wall we have the mouldings & expertise to meet the challenge. We offer professional & friendly guidance helping you to choose a framing solution that enhances & compliments your artwork. Design advice & price quotes freely given with no obligation. 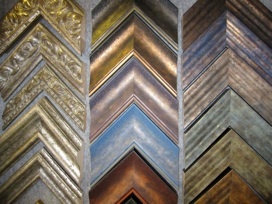 A huge range of mountboards from ‘white core’ to ‘conservation’ grades, suedette, metallics, blackcore etc.